For other uses, see Knot (disambiguation). 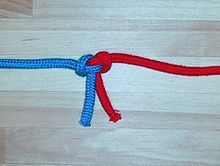 A knot is a fixed looping of a piece of string or rope. Knots are often used for binding things together. While a knot is often made from rope, it can also be made from many other things. In fact, a knot is actually the condition a long flexible object is in. For example, hair can be tied in a knot. The ends of balloons are tied in a knot to prevent the air from escaping. The average person over 5 or so years of age is likely capable of tying a knot; most of these knots people tie are probably with their shoelaces. Ribbons are also tied in a knot so as to appear pretty, as when wrapped around a gift. In addition, knots are also made by sailors in many different forms and for many different purposes. There are even people who have adopted knot-making as a hobby. Wikimedia Commons has media related to Knots. The Simple English Wiktionary has a definition for: knot. This page was last changed on 12 September 2018, at 04:40.